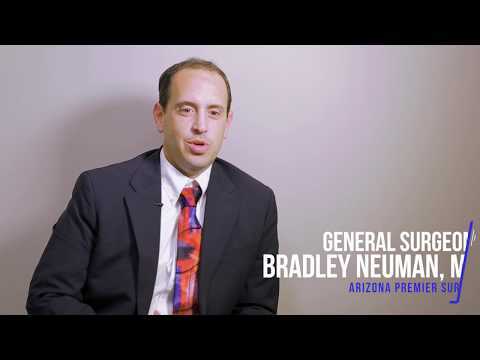 A native Arizonan, Dr. Neuman returned home after he completed his general surgery training to join Arizona Premier Surgery in 2017. His training at large academic centers has given him expertise in multiple surgical techniques including laparoscopic and robotic surgery using the da Vinci® robotic surgical system. His experience in treating a wide variety of clinical conditions allows him to offer his patients the highest level of care in a way that is comfortable for both the patient and their family. Dr. Neuman treats several medical conditions including gallbladder, upper and lower gastrointestinal surgery, hernias, and skin and soft tissue lesions/cancers. He has an interest in complex abdominal wall hernias and has experience with some of the newest techniques for treating this condition. Dr. Neuman has both a bachelor and masters degree in music performance from Arizona State University and Michigan State University, respectively. After leaving the world of classical music, he obtained his medical doctorate (MD) from the University of Arizona School of Medicine. He did his intern year in general surgery at The University of Arizona, and completed his general surgery training at Penn State University, in Hershey, Pennsylvania. Dr. Bradley Neuman is a board-certified General Surgeon specializing in gastrointestinal, gallbladder, and hernia surgery.